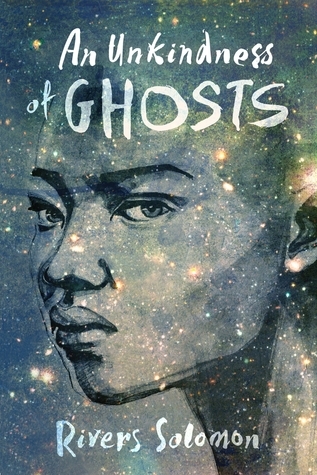 An Unkindness of Ghosts is easily one of the best science fiction novels I’ve read all year. It’s a powerful book that would appeal to fans of Kameron Hurley and Octavia Butler. An Unkindness of Ghosts is set aboard the HSS Matilda, a generation ship that’s been sailing through space for three hundred years. The ship’s strictly divided along class, race, and gender lines, with the upper decks exerting an authoritarian control over the lower decks. The lowest of the decks are forced to labor in the fields, dealt arbitrary and harsh punishments from armed guards, and suffer a myriad of other abuses. In short, it’s a generation ship where the divide between first class and steerage resemble the antebellum South. Aster is a lower deck woman. She’s forced to labor in the fields like everyone else, but she’s also been able to gain enough of an education to act as a doctor for the others in the lower decks. When her friend Theo, the ship’s Surgeon, brings news to her that Matilda’s sovereign is dying, Aster bids him good riddance. Except, the man due to replace him as supreme ruler is somehow even worse, and the sickness that’s destroying him bears an uncanny resemblance to the writings of Aster’s dead mother, a suicide from twenty-five years ago. Aster always assumed that her mother was going mad, but her notes hint that she figured out one of Matilda’s secrets, a secret that might offer hope for Aster and all the others brutalized by Matilda‘s oppressive systems of power. First off, this book is incredibly diverse. The cast includes queer characters, characters who are neurodivergent or mentally ill, and characters of color. Aster’s black, intersex, and autistic. Her friend and mentor Theo is nonbinary and disabled. Her best friend is mentally ill. The woman who raised her is aro ace. These characters are the protagonists and most major supporting character. While the focus is mainly on Aster, the other three all receive sections from their first person point of view. At first I thought these sections were out of place, but by the end I came to appreciate them for how they expanded our knowledge of the characters. Different parts of the ship have different notions and concepts regarding gender. One level refers to all children with “they/them” pronouns. Another level assumes everyone’s a woman, unless they say otherwise. Additionally, intersex individuals are common on the lower decks, which generally blur the gender binary. In the upper decks, a rigid heteronormative, patriarchal, gender binary is strictly enforced, and they try to force the lower decks into their views of how gender “should” be. Before the time span of the book, there was apparently also a breeding program, and abortion remains illegal. It happens anyway, only under threat from the authorities. The back blurb calls the people of the lower decks sharecroppers. I don’t think that’s true — I think they’re slaves. While they may not be owned by any one individual, they are treated as property, from beatings and rapes to being locked in a box for days on end or having their children taken from them. An Unkindness of Ghosts delves deeply into the reaction that this constant trauma can have on the victims, but it doesn’t revel in the violations. Many of the worst physical sufferings are only alluded to, or the results of the violence are shown, not the violence itself. As horrific as it is, I can see how the world of the Matilda could grow from present day America. My guess is that it would start with the linking of economic and racial disparities, with the steerage class being disproportionately black compared to the first class passengers. And given three hundred years in a closed system, those disparities more and more reflect America’s dark history when it comes to race. In this brutal system, Aster is a woman with very little power. She has her sharp intellect, but she’s often at the mercy of those more powerful than her. An Unkindness of Ghosts is largely the story of Aster fighting for what agency she can and managing to survive in an intolerable situation. And eventually, the revelations of her mother’s journals offer hope. An Unkindness of Ghosts has a slow start. It doesn’t begin with guns blazing or any action packed scenes, but when I got into it, I really got into it. By the end, I had trouble putting this book down. I would still say that it’s a slower paced novel, more focused on the characters and their relationships than machinations of the plot. An Unkindness of Ghosts is a seriously impressive debut novel. Thoughtful and riveting, this is not a book I will ever forget, and I’ll be watching eagerly to see what Rivers Solomon does in the future. I don’t know what else to say. Please, do yourself and the world a favor by reading this book. I received an ARC of this book in exchange for a free and honest review.